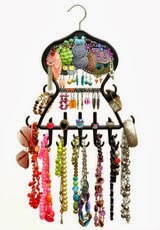 Tired of untangling necklaces and having your Super Savvy Daughter's jewelry throughout the house? Check out my review of the Roxsee jewelry hanger. My two little girls love jewelry. We have a ton that has been floating around our house in every spot from the dress up drawer to hanging from key hooks in our mud room. I didn't like the idea of a jewelry box because all the metal chains would get tangled and it would take me a good while to get them untangled. So when I was given the option of doing this review I jumped at the chance because it would be a much needed answer to a problem in our house. Untangle my chains was founded by 3 women who were brought together by tangled necklaces. They set out to make a solution to the tangled necklace problem. What they got was the Roxee Jewelry Hanger and a selection of their favorite products. They manufacturer in the USA and have a eco-friendly practice. I loved that I could hang the Roxeee Jewelry Hanger anywhere from the wall, over doors and even on the closet rod. In effort to get the Roxee Jewelry Hanger where my girls could access it easily I put mine in their closet. Then I sent them off to gather there jewelry from the far reaches of my house. Everything from medals to rubber band bracelets, the Roxee Jewelry hanger held it all. It has 400 earring holes at the top section of the hanger. It has 15 hooks, great for your bracelets and necklaces and 5 posts, for all your rings. The hanger also allow you to spin it so you can access both sides. It is made from no break polypropylene so it's sturdy enough so it should last. My girls love their new Roxee Jewelry Hanger and I love that I'm not finding their jewelry everywhere. It also comes in Pink!